We are just a few weeks away from welcoming our sweet baby boy to the world! We’ve been prepping our house, schedules, and lives like crazy for months and I can’t believe he’s almost here! Like all first time moms, I’ve researched for hours and hours on what I’m actually going to NEED when the baby gets here, and what I could probably do without. There are thousands of “baby essentials” posts, opinions, and YouTube videos, but after all of my research and some advice from my sisters, I’ve put together a list of what I truly believe to be the 10 baby MUSTS. What are your go-to baby products? Let us know in the comments below! If you haven’t heard of Solly Baby I’d run (or quickly type it into your search bar) and check them out right now. 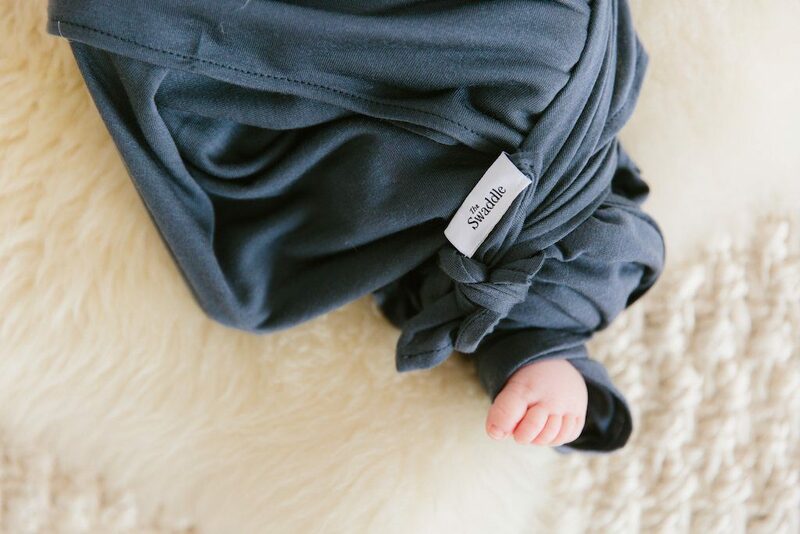 Between their wraps, swaddles, and buttery soft baby clothes, Solly Baby is coming in high on our 10 newborn must have list. All Solly Wraps are custom-made from certified Lenzing modal, which is a lightweight, buttery soft and sustainable fabric sourced from the pulp of Austrian beechwood trees. It makes carrying your cute little baby with you everywhere. We are so excited to use the Solly swaddle on our little guy. We’ve bought about 10 different swaddles unsure of what we (or baby!) will prefer, but I can tell you one thing, these are the softest, stretchiest, and most beautifully made. I have a feeling we’ll be ordering a lot more of these. Lastly, but certainly not least, the Solly Layettes. They took their soft buttery fabric and made them into delicious (is that an okay word to use on baby clothes? Because that’s exactly how I know he’ll be in that tiny outfit!) two piece sets. We went with the Dried Herb set, but they come in all of the same fabrics and colors as their beautiful swaddles and wraps. When it comes to choosing products for my baby, I knew I wanted to choose clean products that were actually beneficial to my baby’s very delicate skin. Aside from being toxin, gluten, paraben, sulfate, artificial fragrance and color, BPA and Animal cruelty FREE, all of their products are dermatologist tested and and pediatrician approved. Not to mention they smell INCREDIBLE. Tubby Todd products are known to clear up skin irritations and rashes on newborn babies and toddlers with their natural ingredients. I honestly can’t think of products I trust more, and I honestly have already been using them on myself! We started out with this basics bundle, but you can’t go wrong with any of their products! I’m already a bundle of nerves and our little guy isn’t here yet. As a mom, my number one responsibility is to make sure our little guy is healthy and comfortable. We’re planning on having baby boy sleep in our bedroom for the first few months, but even with him next to us, I already know my light sleeping self is going to be up with every squeak, cry, and movement. 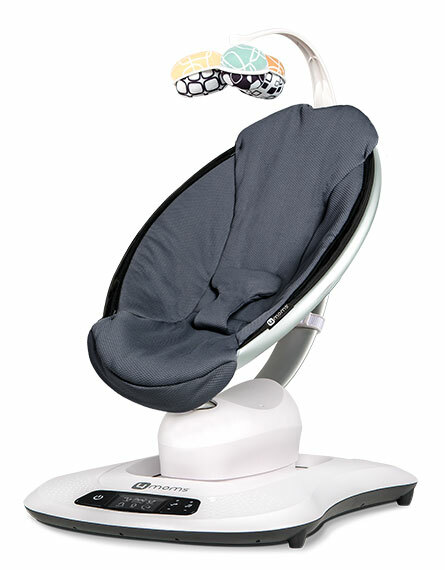 My sister Stephanie suggested I look into the Owlet Monitor for a little extra peace of mind when we brought baby home. After looking into it, here’s the reason we ultimately decided it was something we couldn’t live without. 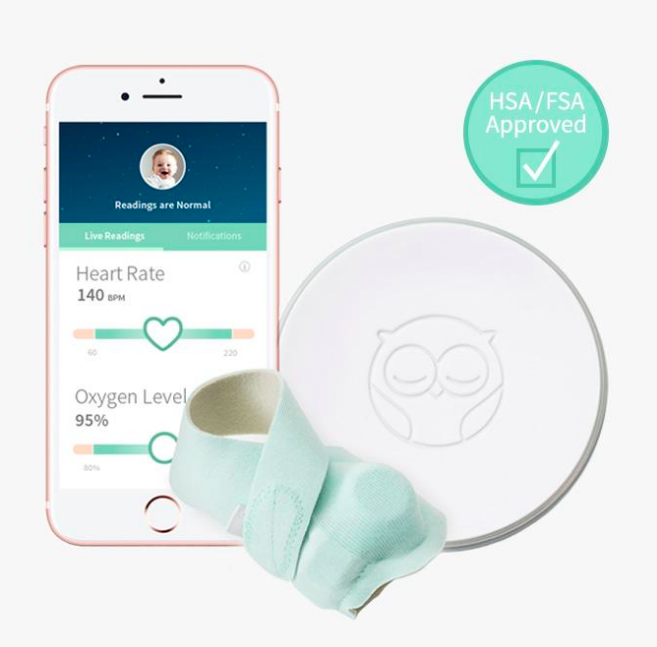 The Owlet Smart Sock is placed on the baby’s foot to track their oxygen and and heart rates. It notifies you when either falls out of the preset zones. Staying informed of my baby’s needs, while getting a little peace of mind, is definitely going to be a HUGE help in getting some extra sleep. Using the Owlet App, I can see live readings of his heart rate and oxygen. What mom wouldn’t LOVE that? I know baby boy won’t be sleeping too much at night, but any sleep we can get, we will take! 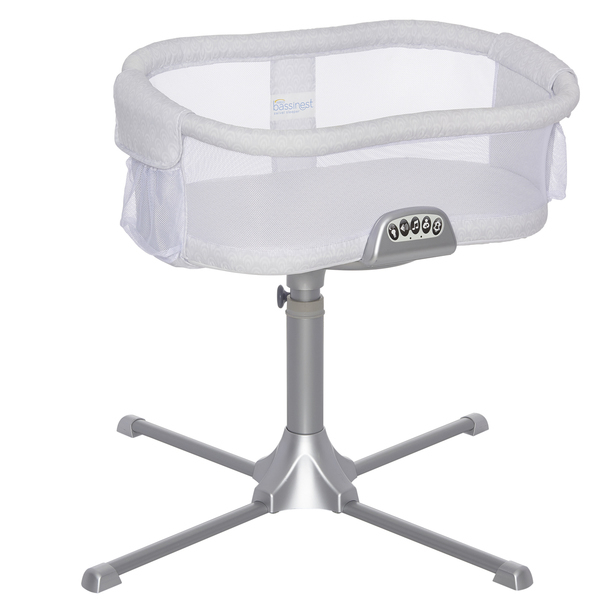 There are SO many different bassinet options out there and they vary from super cheap, to over $1000 (like WHAT?!). Mesh sides so we can see into the bassinet from our beds. The fabric is breathable and safe. It’s called a Swivel Sleeper because of the 360 degrees it moves and swivels. You can bring your baby close while staying in bed. This is going to make healing postpartum much easier. Lowering side wall to easily lift the baby from the sleeper. Sturdy, but adjustable base that fits right underneath our bed, allowing the bassinet to be close to us, but giving the baby his own sleeping space. Nightlight, sounds, vibrations, and a back to bed reminder all controlled right on the side of the swivel sleeper. Probably my most favorite feature – STORAGE! Pockets on each side of the swivel sleeper to store anything I’m going to need in the night to care for baby boy. To help us get even more sleep, we decided to try out the Sleep Sack Self-Soothing Swaddle. It’s designed for infants who don’t like to be swaddled with their hands by their sides, but like to self soothe with their hands up. 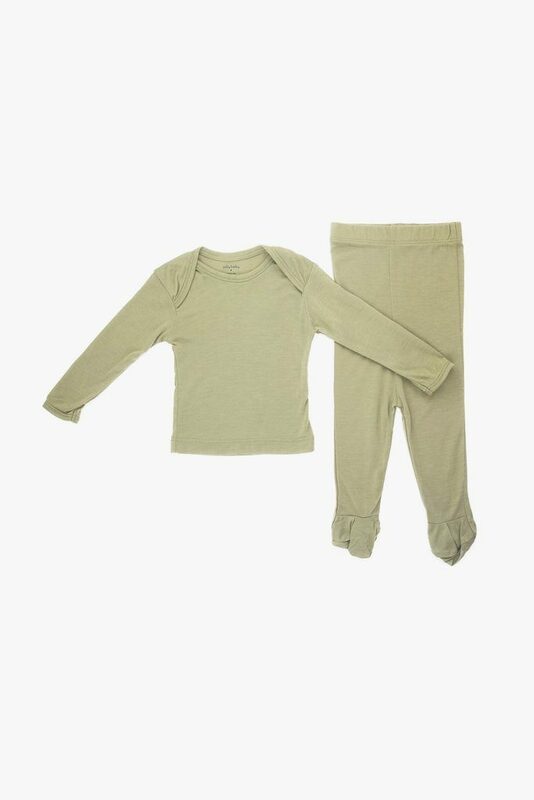 The swaddle includes silicone teethers on the sleeves to give relief to a teething baby. This swaddle comes in a newborn size and a small size, so we can size up when baby boy grows out of it. 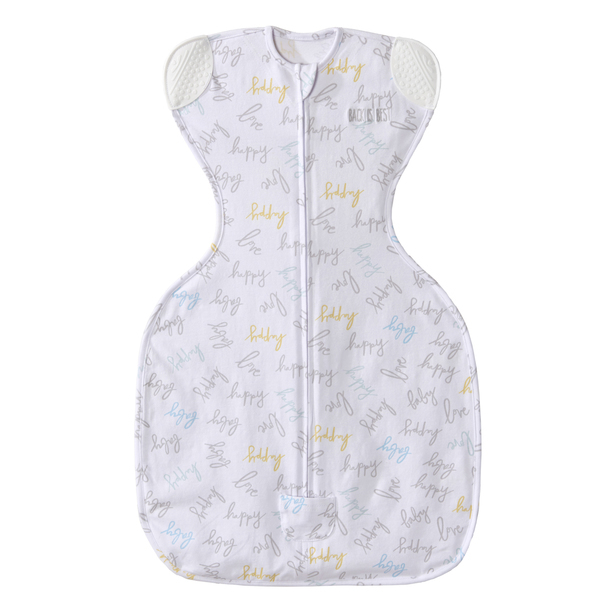 We love that it’s a zip swaddle, to make my life a little easier after a nighttime diaper change. Obviously diapers are a must have for all newborns, but we’ve been asked about 100 times which brand we’d recommend, so I’m here to tell you our official favorite diaper brand is Huggies. We’ve found these diapers to be the most leak proof, mess proof, and flexible. They really do grow with your baby through every stage. If you’re looking for a unique gift idea that you can personalize yourself, Huggies, Made By You now has the cutest diapers that you can design and make special for a little baby! It is a PERFECT gift idea for any expectant Mom! My cute sisters gave me a care package of personalized diapers AND freezer meals. You can see more about it here! We wanted to be prepared for anything with a new baby, and the Fridababy helped us do that in one simple step! Fridababy offers tools to deal with gassy tummies, skin irritations, fingernails, runny noses, toothbrushing and so many other baby needs. We purchased the simple starter pack to begin with, but they have awesome products for moms and dads too, because raising a baby takes a whole team! We love their products and have them set up right next to our changing station to be prepared for anything. As simple as this one sounds, it’s SO important. I knew I wanted a sound machine and a nightlight, but I didn’t realize I could get them all in one. We went with the Hatch Baby Night Light and Sound Machine to keep in our room to help our baby sleep peacefully and give us some light for those late night diaper changes. You can customize color, brightness, sound, and volume level all from your phone which will make things very convenient. We trusted the 1200 5 star reviews on Amazon and we are not disappointed yet! You can check it out HERE. We’ve been a huge fan of everything Fawn Design from day one (how can they even make fanny packs look good?! ), but we cannot get over their brand new design on their original bags. 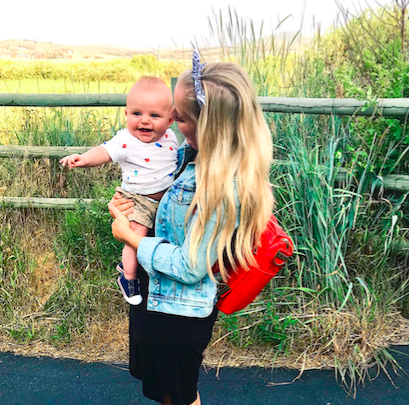 They make the perfect diaper bag with multiple pockets inside and out, but also makes a perfect everyday bag! 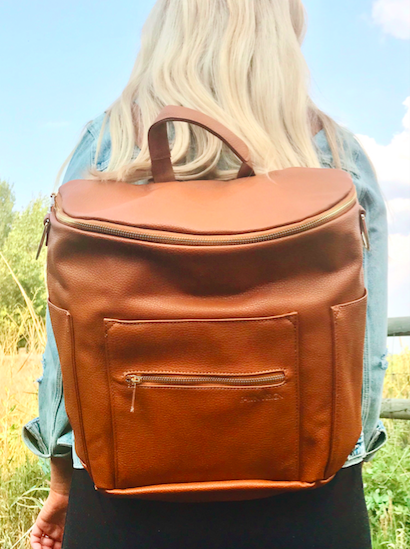 It can be worn as a backpack, or over the shoulder with removable and adjustable straps. It’s every mom’s dream diaper bag. I got my Fawn Design bag a few months ago on our Girls Getaway, but I’ve been saving it until the baby comes! The Fawn Design Original comes in seven beautiful colors. They also have fanny packs, totes, and wait for it…. mini Fawn bags! A few months after finding out I was pregnant I visited Steph and her cute little family in Southern California. 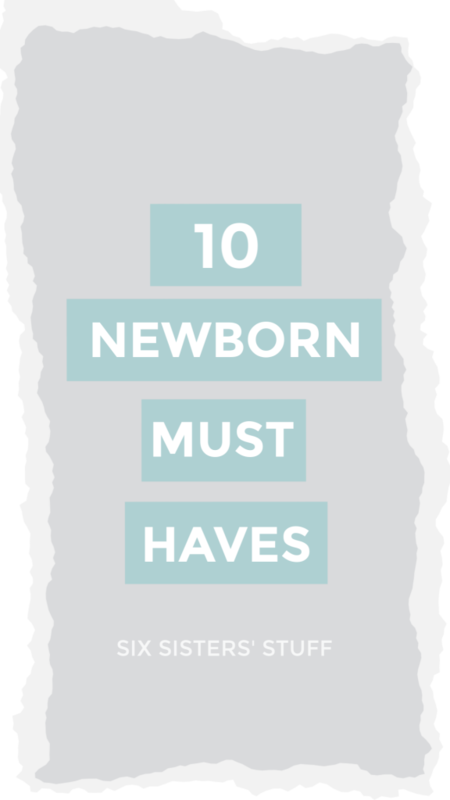 She had a baby boy last year and I knew she would tell me all the baby must haves! Steph had a 4Moms Swing in her living room and for some reason, it completely captivated my husband! We looked around at a few other swings and seats, but kept coming back to this one. 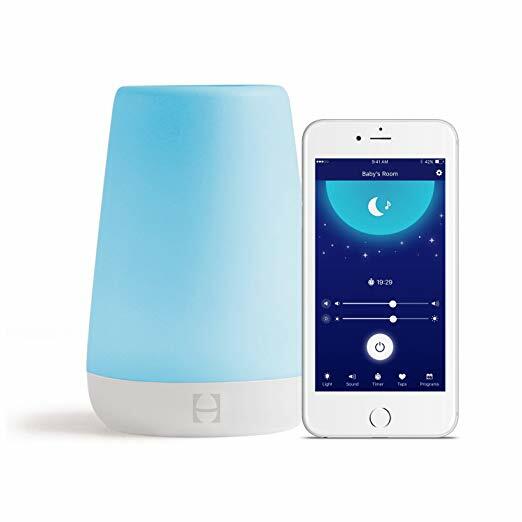 It can be controlled from your phone, and connects to bluetooth to play any music or sounds your baby loves. With 5 different motions and speeds every baby is happy, and every mom gets a little break while the baby enjoys some swing time. We have this set up and ready to go and can’t wait to see how much baby boy loves it! I’ll definitely be taking a few weeks off after the baby comes, but knowing myself, I’m going to need to get outside a little bit to maintain my sanity. We wanted a jogging stroller but couldn’t find one that I felt had everything we were looking for. I decided to take it once again to my sisters (are you seeing a pattern here?) and had the overwhelming response that Joovy Jogging Strollers were the way to go! We ended up with the Joovy Zoom 360 Ultralight. 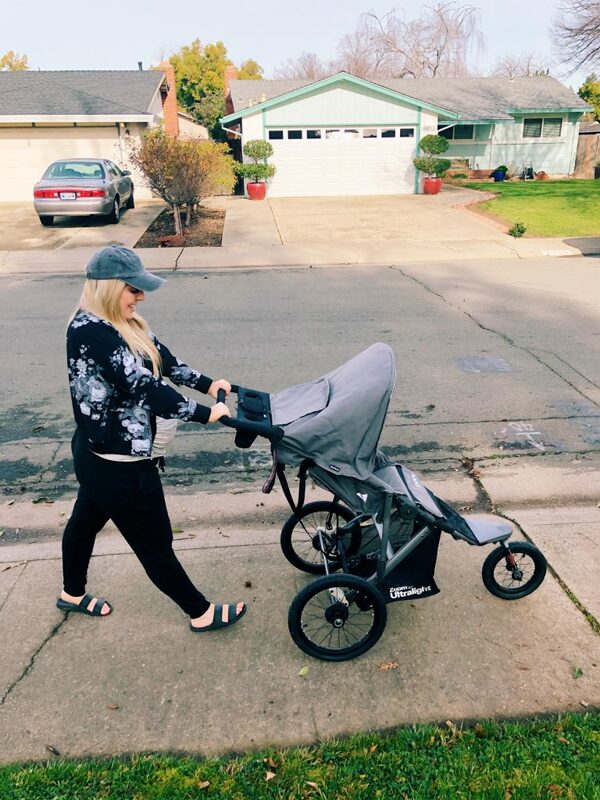 I decided to take the stroller out for a test run before the baby came here and I am so excited to use it when he comes! 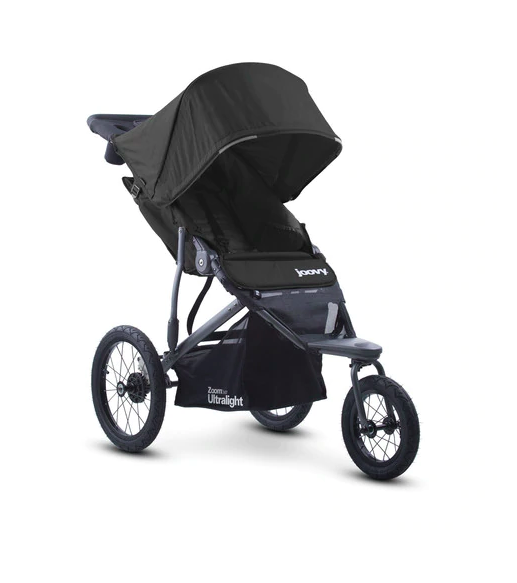 There are so many reasons why we love this jogging stroller, but we’ll just share a few. I love the large inflatable tires that absorb every bump and shock to keep the baby comfortable while we hit the pavement. It’s also extremely lightweight and has great storage compartments. Another thing we love is the fact that we can buy car seat adapters for our Joovy. This will allow us to reuse the stroller for each kid and car seat. We are so excited for this sweet boy to join our family! With these items, and everything else we’ve been working on I think it’s safe to say we are officially ready. Now we wait! What are your must have baby products? Let us know! One of my very top must is a saranoni blanket. www.saranoni.com Honestly a can’t live without and now we all have the big ones!